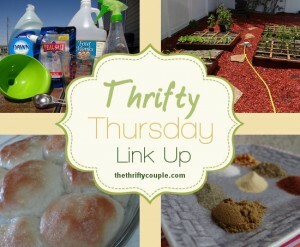 Welcome to Thrifty Thursday Link Party! Thanks for checking us out if this is your first visit. If not, WELCOME back! The theme of the week features EASY ways to keep those pesky New Year’s Resolutions. It looks like the theme from last week is honestly moving forward and fulfilling your New Year’s Resolutions. How many of us declare on December 31 that we will be more organized, or we will spend smarter, or we will eat healthier starting January 1? How many? Raise you hand! Own it! These blogs offer some GREAT ideas on getting started, staying the course, and finishing strong! These are so unique and interesting. Check out these amazing blog posts, I hope you enjoy them as much as I did!